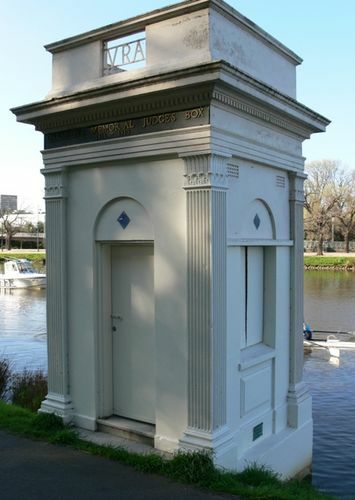 The Judging Box was erected by the Victorian Rowing Association in memory of members who died in service or were killed in action during World War One. In the presence of a large gathering of rowing men, Mr. A.T. Shepherd, vice-president of the Victorian Rowing Association, opened the Oarsmen s Memorial, a judge s box, at the Henley finish on Saturday afternoon. The box had been erected to the memory of the 263 members of the Victorian Rowing Association who had died on active in the great war. Their names were inscribed on the memorial erected by the association in the Alexandra-avenue some years ago. The subscriptions in hand were supplemented by donations from the Henley committee, the public schools and the V.R.A. The work was carried out at a cost of about £370. A bronze panel over the entrance door has the inscription, "Victorian Oarsmen`s Judges Box, 1914 -1918. Age (Melbourne), 17 November 1930.